Meccano Home exists. 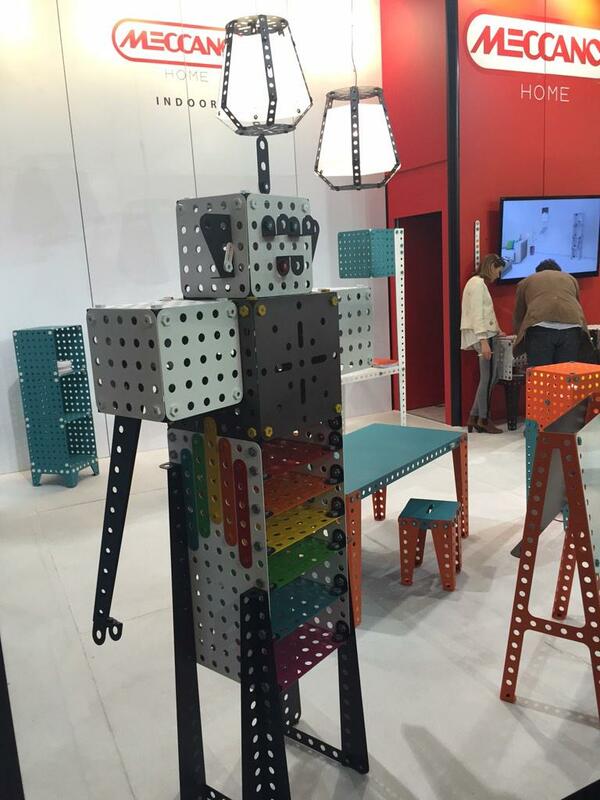 It was conceived by a constellation of designers and engineers in France whose names appear on various websites in varying pairs, so who knows, Meccano Home has a thousand fathers. The brand is licensed from the toy manufacturer, though. So technically a separate operation. Meccano Home feels pretty true to the toys. It is made of sheet steel, painted and rough-finished; if it doesn't feel totally like a truck bedliner, then it is still rougher than a powdercoat. Probably helps with fingerprints. Colors are mix and match. Except legs are sold in packs of four. Some retailers have already done the mixing for you, so you get what you get. There is some hype about Meccano Home right now, but there was this time last year, too. It is because of the Maison & Objet trade fair. And possibly because the launch hype preceded the actual retail/distribution hype. I can't find any US distributor yet. The UK distributor, Holloways of Ludlow, from whom the photo above was ganked, only just got on Twitter. Though everything looks appropriately childish, the only actual Kids items are a small chair and playtable/desk, and an easel. Of course, you should feel free to put a bunch of storage cubes and shelf units in the kid's room too. It is rather expensive, though I've also seen it for 40% less than this.